Cesarean section is an operative procedure to deliver a viable fetus or more through and abdominal and uterine incisions. A lower (uterine) segment Caesarean section (LSCS) is the most commonly used type of cesarean section used today. 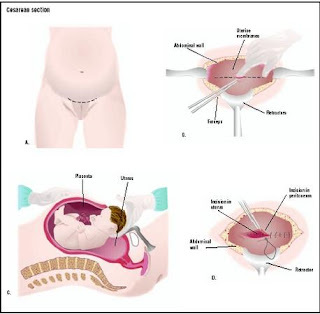 It includes a transverse cut just above the edge of the bladder and results in less blood loss and is easier to repair than other types of Cesarean sections. 2. Cleansing and Draping:The skin should be cleansed preferably with Povidone-iodine 7.5% in order to prevent surgicial site infection. Surgical site should be draped with nonadhesive drapes if possible. These have been shown to be associated with a lower rate of wound infection than adhesive drapes. 3. Abdominal incision: A transverse skin incision is associated with reduced postoperative pain and is more esthetically acceptable to patients compared with a vertical incision (classic). The Pfannenstiel incision is slightly curved and made 2 to 3 cm above the symphysis pubis. The incision should allow for at least 15 cm of exposure. The skin and subcutaneous fat is incised with electrocautery. 4. Uterine incision: The anterior rectus sheath is incised transversely. The rectus muscles are separated in the midline. The parietal peritoneum is opened. The loose peritoneum over the lower uterine segment is held and incised transversely, for about 10 cm in a semilunar fashion with its edges directed upwards. The bladder is dissected downward and is retained behind a Doyen’s retractor placed over the symphysis. Membranes are ruptured by toothed or Kocher’s forceps. 5. Delivery of the infant: The head is delivered by introducing the right hand gently below it and lifting it up helped by fundal pressure done by the assistant, using one blade of the forceps or, using Wrigley’s forceps. If the head is deep in the pelvis it can be pushed up vaginally by an assistant. The Doyen’s retractor is removed after the hand or forceps blade is applied and before head extraction. Suction for the foetus is carried out before delivery of the head. In breech or transverse lie the foetus is extracted as breech. Once the umbilical cord is clamped and cut, it is time to deliver the placenta via spontaneous extraction. Gentle traction is placed on the cord and oxytocin is used to enhance uterine contractions. The placenta is checked to make sure it is complete and the uterus is explored with one hand to remove any remaining membranes or placental tissue. The uterus is than massaged to promote contraction. Oxytocin is given to promote uterine contraction and involution. 6. Closing the uterus: Closure of the uterine incision is done in 3 layers. The first is a continuous locking suture taking most of the myometrium but not passing through the decidua to guard against endometriosis and weakness of the scar. The second is a continuous or interrupted one inverting the first layer. The third is a continuous or interrupted layer to close the visceral peritoneum of the uterus. Similarly, the rectus muscles are not surgically reapproximated. The fascial tissue is carefully closed to provide good wound strength and the skin is closed with a subcuticular suture.